A Visit to Sighisoara, Romania is a Colourful, Medieval Experience. 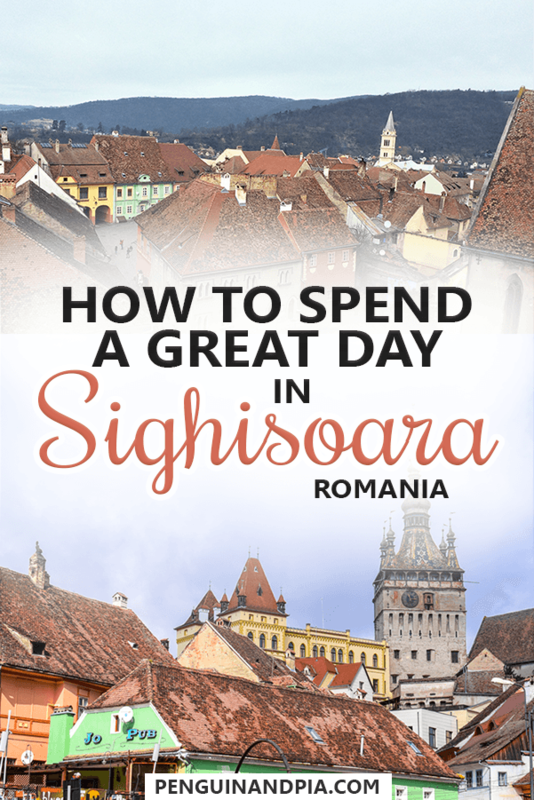 If you’re in Romania, you just have to stop in and see Sighisoara.. or do you? The “fairy tale town” as it’s described is certainly visually stunning and a nice place to visit. Seemingly stuck in time, the old town is one of the best preserved medieval fortifications in the world. For us, Sighisoara is a great example of how travellers’ expectations can be very different from reality. It’s videos like this from UNILAD Adventure that have built up these fantastical images of wanderlust in peoples’ heads. We can attribute this to the role social media plays in shaping the travel narrative before you’ve even visited a place. Setting up travel expectations isn’t always a bad thing – but we think it’s important to continue this conversation. Don’t get us wrong – we’re grateful for our experiences and our fortune to be able to travel. 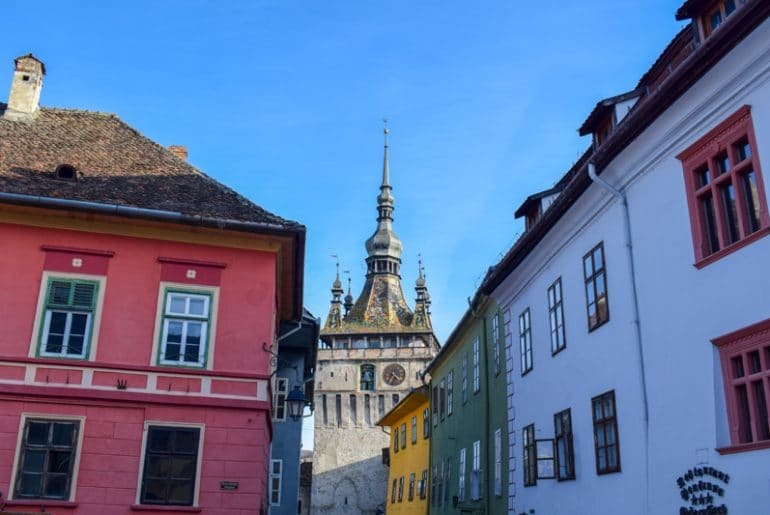 We just hope that we can add our honest account of Sighisoara to help you plan the perfect trip for you if you’re heading to Romania. Let’s dive in! If you want to form your own opinion about whether or not to visit Sighisoara, feel free to watch the video snippet below and the post for a well rounded perspective. In case you want to watch the whole video, you can find it on our YouTube Channel here. Romania is a fascinating country. Read up on Our First Impression of Romania. Discover Bucharest – the Capital of Romania. Read Our Weekend Trip in Bucharest! Find the Perfect Place to Sleep in Bucharest. Here’s our Hotel and Hostel Guide for Bucharest. Heading to Brasov? Here are a Bunch of Awesome Things to See and Do! Planning on Sleeping in Brasov? Read Our Guide to Brasov Accommodations. Taking a Day Trip from Brasov? Here are Some of the Top Ideas for Day Trips! 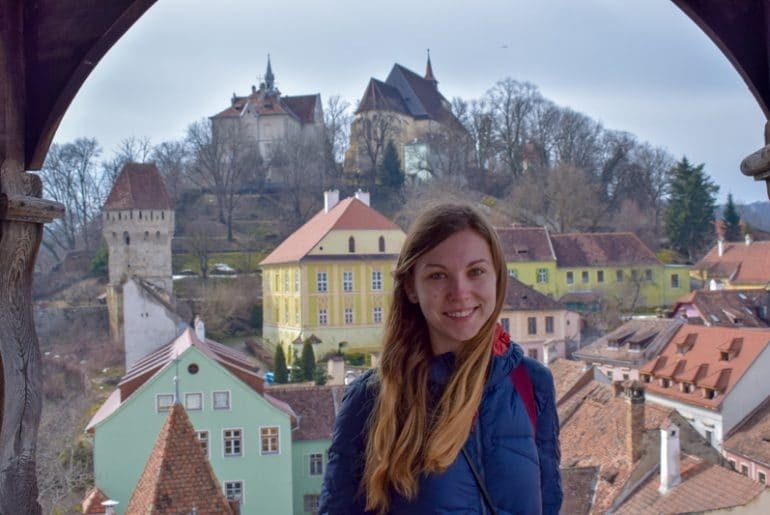 To Sighisoara, or Not to Sighisoara? Sighisoara is located in the famed region of Transylvania. It lies about 2 hours northwest of Brasov, 2 hours northeast of Sibiu, 2.5 hours southeast of Cluj-Napoca, and 4.5 hours northwest of Bucharest, the capital of Romania. Because you’re in the heart of Transylvania – yes, you’ll hear the reference to Dracula everywhere you go! The view of the old town from Piața Hermann Oberth. There are only four main ways to get to Sighisoara: train, bus, drive there yourself, or hop on a tour! We can’t speak to driving since we took the train but Google tells us that if you rented a car you’d take the DN13/E60 from Brasov and it’ll take about 1 hour and 40 minutes. From Sibiu, you take the DN14 the whole way and it’ll take about the same time frame – 1 hour and 40 minutes. There are direct train connections from Brasov, Cluj-Napoca, Bucharest and Sibiu. However, we found that train times are not always the most convenient. You can check for the train schedule here at the official website for CFR Romania. You should also remember that trains in Romania are quite slow. Our journey from Brasov took us over 3 hours and it was only approx. 130 km – but the experience was worth it as you get to see more nature/lots of small towns along the way. As times are not always the most convenient, you might want to spend a night in Sighisoara. This is exactly what we did but looking back a few hours would have also been enough if we were pressed for time on our trip. You could also take a bus to Sighisoara from most large towns. However, the bus can be more expensive than the regional trains where the cheapest ticket is when reservation is not compulsory. The bus might be an option for you as they offer different times than the trains. You can check the bus routes here. We do know that there are direct connections from Brasov. If you don’t want to deal with inconvenient train/bus times and/or spend over 3 hours on a train, then an organized tour might be for you. 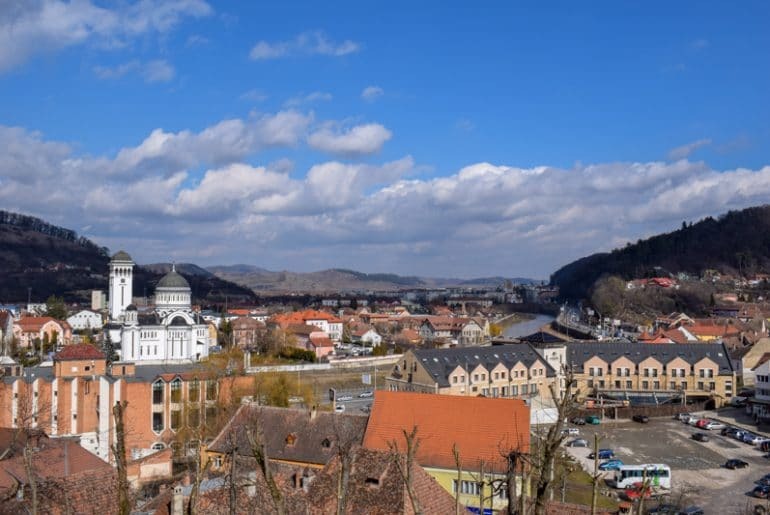 A Day Tour of Sighisoara from Brasov and a Tour to Explore Sibiu, Sighisoara, and more on a 5 Day Tour from Bucharest. The roof of Biserica Mănăstirii from the Clock Tower. 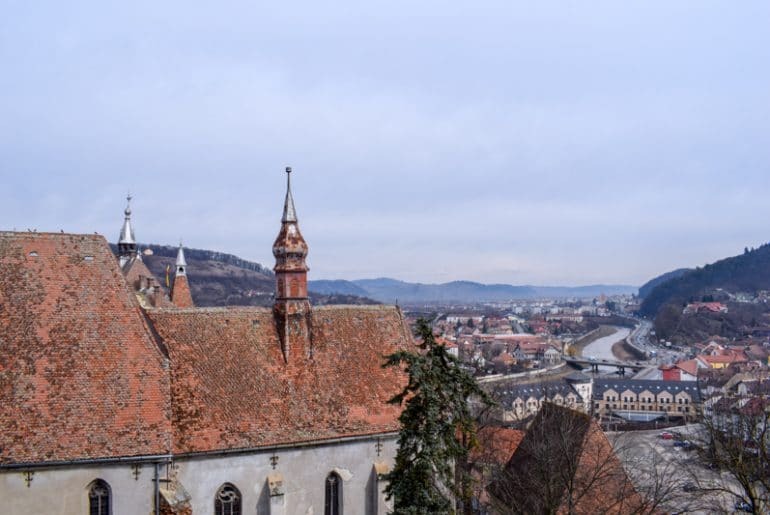 German craftsmen/merchants known as the Transylvanian Saxons settled in Sighisoara (or Schäßburg, which is its German name) because they were invited by the King of Hungary. The Romanian name for the city was first established in 1435, according to documents found. It was one of the most important cities in Transylvania with art and craftsmanship playing a defining role in the city. How big of a role? Well, it’s estimated that between the 16th and 17th century there were 15 guilds and 20 handicraft branches in Sighisoara! If you are interested in that kind of history, Sighisoara is a great place to check out. Vlad Dracul, the father of Vlad the Impaler, once lived in the city – and this is one reason why some people come to visit it. Today, the city is considered one of the best-preserved medieval fortified cities and citadels in Europe. As such, Sighisoara has been a UNESCO World Heritage Site since 1999. 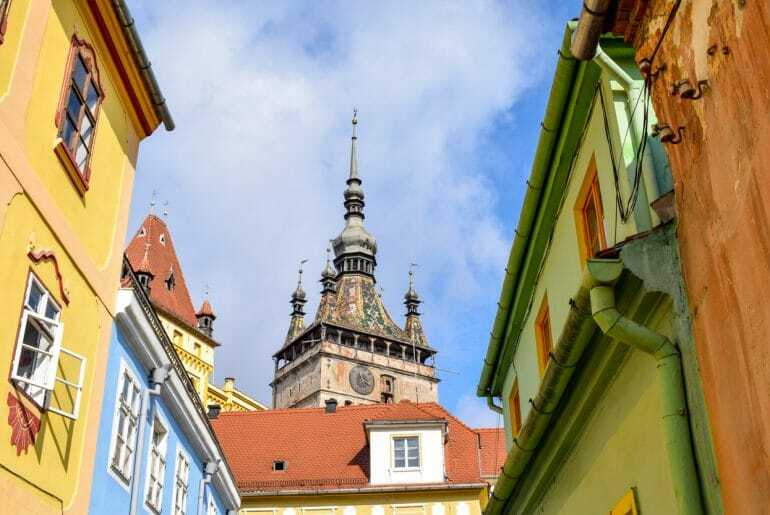 Since Sighisoara is so easy on the eyes, it draws a large tourist crowd year after year. As such, you’ll find many guesthouses and hotels within the old town or very close by. Tourism is an important industry in Sighisoara so you shouldn’t have any issues finding a place to spend the night. During the high tourist season and especially during the medieval festival in July we would recommend booking in advance! Strada Tâmplarilor – the door to our guesthouse is on the right. When booking our accommodation, we wanted a cheap place with decent reviews that was in the Old Town. We ended up at Casa Lia – and it did not disappoint! While it’s technically a guesthouse, it has a variety of private rooms all throughout the building. Marius was the host and he was super nice. Upon arrival, he sat us down to go over the map of Sighisoara and his recommendations for restaurants. He then offered us Romanian brandy (which was an excellent shot) and some cookies. What a guy. The location was incredible – Casa Lia is right in the middle of the fortified old town. 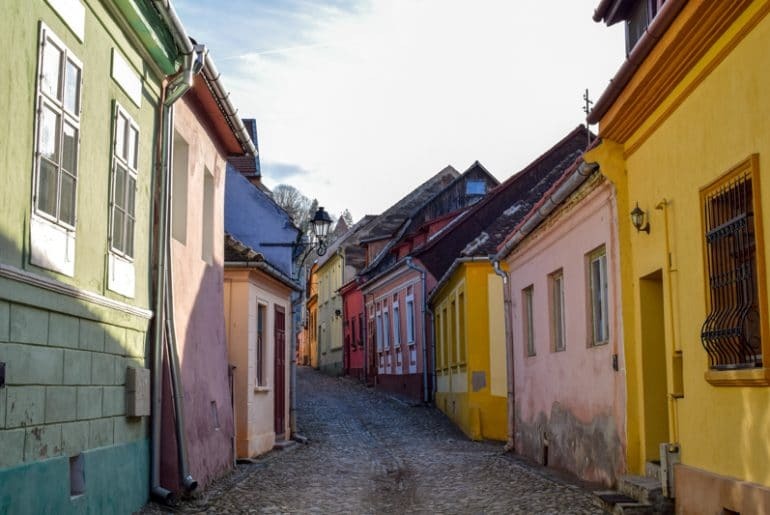 It’s actually located on one of the most colourful streets in Sighisoara. As for the room, it was simple and pretty big. We had a shared bathroom with another room but since the place was empty it was just ours to use! In any case, if you are looking for a cheap place to stay for a night, we can only recommend Casa Lia! Check here to see if you can book a stay with Marius at Casa Lia. We’ll mention the Gasthaus Alte Post further down below because aside from being a great restaurant they are also a beautiful hotel. While it is not located within the walls of the Old Town, it’s very, very close by. They offer nice hotel rooms at a mid-range price. Judging from the look of the restaurant and the photos we had seen, the rooms looked really nice and we almost booked here for one night. The big plus: you’ll have a delicious restaurant right at your doorstep. Book the Gasthaus for an amazing stay in Sighisoara! The view from the Church on the Hill. Located right on the main square, Hotel Sighisoara is another one of the hotels we seriously considered booking. It’s more of a hotel than a guesthouse with large rooms equipped with minibars and televisions. There’s also a wellness centre and a hot tub, in case you love hot tubs. In all seriousness, Hotel Sighisoara is in an old building from the 16th century and the decor is very medieval Transylvanian which gives it this authentic feel. There’s also a restaurant inside and we flipped through h street menu but decided on another place (Gasthaus). Apparently the restaurant isn’t too bad! If you want the medieval old town literally at your doorstep then book a room at Hotel Sighisoara! Admittedly, there isn’t an absolute ton to do in Sighisoara. It’s a beautiful old town that is great to explore and makes for beautiful photos. As for substance, there’s only so much travellers can do while visiting. This is part of the reason we’re hesitant to be like “go go go” to other travellers. However, we’ll get into this discussion further down. For now, here are a few of the things we did while in Sighisoara. Eric caught photographing the famous colourful street Strada Tâmplarilor. Like we mentioned above, the historic centre has been a UNESCO World Heritage Site since 1999. It’s not too difficult to understand why. The medieval old town is gorgeous. If you are interested and would like to learn more about the history of the old town, you could also consider going on a 2 hour guided city tour. We saw lots of tour groups during our time there but didn’t think to book in advance so we couldn’t do any. Find more info and book your guided tour of the old town here! You can’t visit Sighisoara without climbing up the stairs. What do we mean? Well, there’s a really long staircase – called the Pupils Staircase – which everyone climbs! Built between 1660 and 1662, this covered wooden tunnel of 175 steps as created with the purpose of making it easier for the students to reach the school at the top of the hill. Obviously, we climbed the staircase – and it gets surprisingly dark in there. Lisa at the top of the Clock Tower – the Church and High School are behind her and up the hill! Once you’ve climbed the stairs, you’ll be on top of the hill where you’ll find the ‘Church on the Hill” Biserica din Deal as well as a high school. For a small fee you can go inside the church, but it is also nice to just walk around the outside with a small chapel and fortified tower nearby. Close by you’ll find the Cemetery for the Church on the Hill. If you are interested in finding out more about the previous residents of the town then you can walk through it (it’s huge and multi-leveled) but remember to be respectful! Lisa found it particularly interesting as most of the gravestones had German inscriptions. The Clock Tower from the Main Square. Probably the most interesting thing we did was visit the Clock Tower for the museum and the view. The Clock tower is 64 metres tall and was built in 1556. Before you reach the top, you’ll climb stairs and enter rooms filled with artifacts that tell you the story of the town and of Romanian history. It was quite interesting. Lisa thought seeing the medical instruments that were used in the past was the most interesting part. Eric liked the old coins and paper money. You also get to see the wooden figures on the tower from close up – there is one different “person” for each day of the week and a massive complicated gear system runs the whole thing! At the top, you get 360 degree views of the old town and Sighisoara outside the medieval walls. Always a sucker for a good view, it’s a photo opportunity that shouldn’t be missed. The museum/tower is only open until the afternoon at around 3 or 3:30, so don’t wait too long until you go up there. Adult rickets are 15 lei and students are 4 lei. Want to meet Dracula himself? Well line up and pay 5 lei to see the place “supposedly” where Vlad The Impaler was born. There are lots of signs pointing to it and it looks very touristy – which is one of the reasons we didn’t go in. However, if you are interested in the Dracula narrative and want to see the two rooms at the top of the restaurant then you should visit the Vlad Dracul House. Holy Trinity Church to the left and the DoubleTree Hilton Hotel on the right. If you’ve seen everything there is to see in the old town, you can wander the other parts of Sighisoara. If you arrived by train then you’ll walk through basically half of the town towards the river, cross the bridge, and enter the old town. At the river, however, you’ll find Holy Trinity Church or Biserica Sfânta Treime in Romanian. We didn’t go inside but it’s beautiful to look at and you certainly can’t miss it. On the main street that runs through “downtown” there are a variety of shops and hotels but beyond the obviously touristy things there isn’t a lot more to entertain visitors outside the old city walls. It’s mainly things that the locals need – it is a small village after all. We had a coffee in a cafe across from the park that lies at the entrance to the old town. You can read about it below! 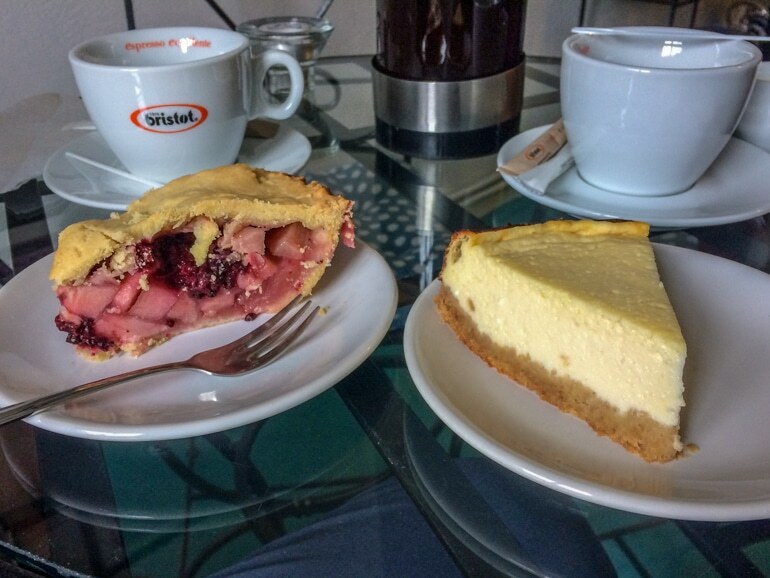 It is worth mentioning that there are not a ton of restaurants and cafés in Sighisoara. You’ll be fine for lunch and dinner, but finding a great café or breakfast place can be a little more difficult – especially within the old town. Below is a list of the places we went to and one that we didn’t but had recommended to us. If you’re craving a hearty meat meal, this is the dish for you. We looked up restaurants to eat before we went on a wander around town and the Gasthaus Alte Post seemed to have great reviews. Lisa also wanted to eat there because it was German. Funnily enough our host from Casa Lia later recommended us the same place so we thought we had to go. This proved to be a great decision. The food was delicious! Eric got chicken paprikash (he’s Hungarian so obviously he ordered the national dish… in Romania) and Lisa ordered a pork, sausage, potato dish that was really good as well. We had these dinners as well as two beer and a shared dessert and the cost was less than 16 Euro. They have three different areas to sit in: a wine cellar (where we were), the main restaurant, and a terrace to eat outside during the warmer months. Overall, Gasthaus was great. 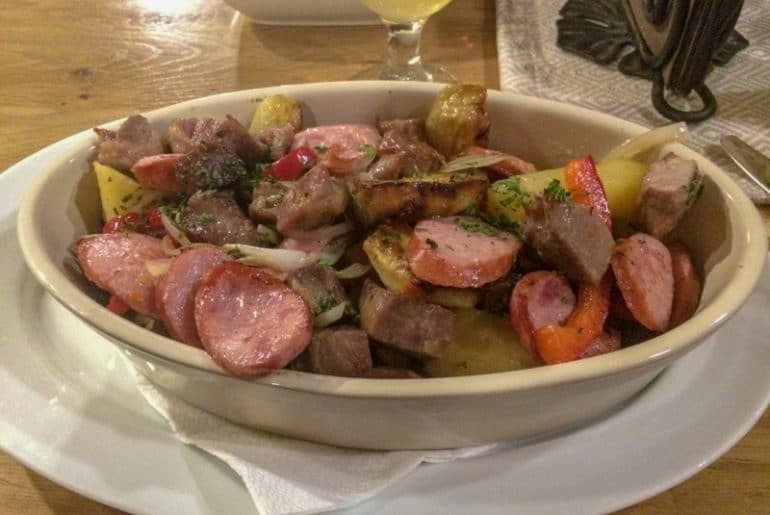 If you don’t feel like hearty, Romanian/Eastern European food and want something fancier (but of course also pricier) you should consider going to Joseph T Restaurant. We only saw it from the outside but it looked quite fancy. People seem to really like it judging from the good reviews on TripAdvisor so go ahead and read the reviews and look at the pictures! The Blackberry Apple Pie and Cheesecake were delicious! International Cafe is a great coffee place right by the main square. You can’t miss the sign – it’s clearly written on the wall! We had great coffee and homemade cake – but they also offer paninis if you’re looking for something more savoury. The older lady working there was super nice and made us feel very welcomed. She asked where we were from and definitely took a liking to us! Overall, it’s the perfect spot for a nice break in the afternoon or for a breakfast/sweet tooth stop. We sat inside but in the summer they also have tables out on the main square so you can enjoy the sun. You know the place you walk by and you’re like “man, THAT place is for the tourists”. That’s Concordia. In need of food and with limited time, we stopped in before we caught our train. The food was a firm O.K. We’re the least picky eaters on the planet so for Eric to say “this pizza isn’t that good” means that the pizza was undercooked and only warm. Lisa had polenta with cheese which she did seem to like but the quality overall wasn’t very good. These comments actually mirror what the Google Reviews say about the food. The good news: Eric had a beer which was great, obviously. We saw a lot of people (read: tourists) on day trips go there but only really have a coffee and not a full meal so if you need a rest and a coffee, go here. If you need food, you’ve been warned – but we wouldn’t recommend. Teodoras is a tiny coffee place outside the old town. We had two Americanos as it was early in the morning and we wanted a little bit of caffeine. We didn’t have any sweets but admittedly the glass case was full of tiramisu and pastries which we definitely wanted to try. They had ice cream machines that look like they are getting ready for the summer season so it’s probably a great spot when the tourists pick up. For us – just a pleasant quiet coffee place. The woman working was also very nice. And there you have it – how we spent our time in Sighisoara! To be completely honest, we enjoyed our time but we feel weird that we didn’t “absolutely love” it. Everyone really liked it – and we only “enjoyed” it? Is it something we missed or didn’t see? Are we allowed to feel this way about such a pretty place like Sighisoara? It’s almost hard to form an opinion that is different from the consensus. Sighisoara seems to be a textbook example of an over-hyped destination that actually lacks substance. This brings us back to the whole social media thing. We’re finding that as more travellers fail to have that perfect magical experience and snap those exact photos like the big influencers do – they have had a bad trip. That their experience is somehow worth a little less or not as good. It shouldn’t be this way. Your trip is your trip and no one can tell you how to experience it. 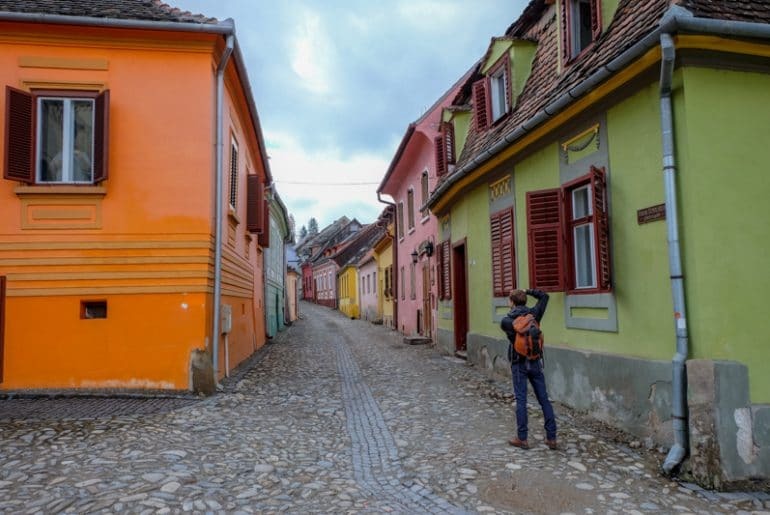 Is Sighisoara colourful? Yes. Is it medieval? Yes. It is tranquil? Yes, absolutely – and if you’re going for those things then you will have your time well spent. But for the purposes of a day trip or longer, to say that you should absolutely go out of your way while in Romania would be false, in our opinion. There are beautiful castles and villages all over the country that should also be worth your attention. 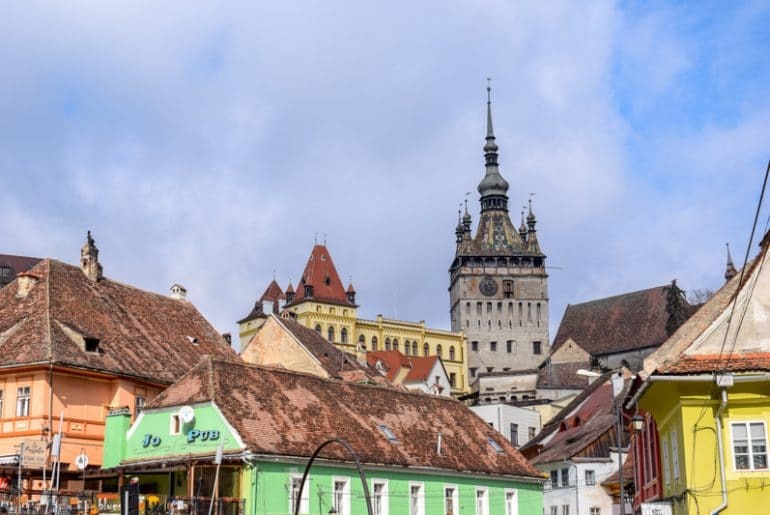 In Sighisoara, once you climb the tower and wander the old town in about two hours, you quickly see past the tourist shops and restaurants that have mediocre ratings. It’s a place that you could wander around admiring while on a short guided tour. We just want people to know that it lacked substance that would sustain a visit lasting anything longer than a day. This is probably why there are so many day trips to head there. 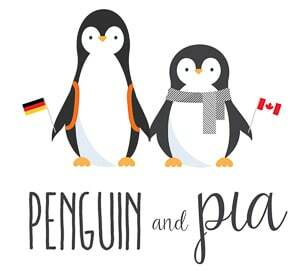 We certainly don’t regret going – just sharing our thoughts! 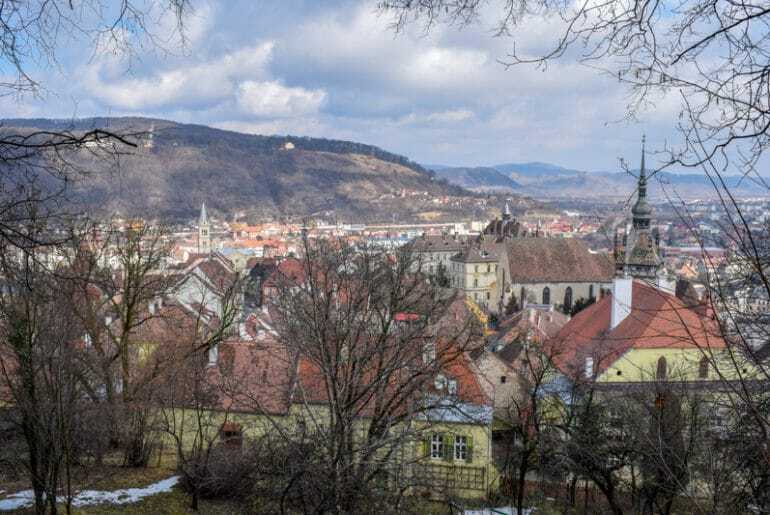 Maybe we’re spoiled because we’re based in Brasov – a beautiful city with many things to do and see? What are your thoughts on the town? Does it live up to the hype or did it fall short of your expectations? It’s always interesting to hear the different perspectives of travellers about the same place. Given how much coverage Romania is getting this year as a “bucket list” and “up and coming” destination, we wanted to try it out first to be able to write about our experiences.